Proverbs 1:22-23: I Will Make Known My Words Unto You! Who are these simple ones that God is talking to in this verse? If you did not know that was you, you are already deceived into thinking too highly of yourself. People on the earth are the simple ones that God is talking to. It doesn’t matter how many degrees that you have or how many universities that you have attended, God calls you a simple one. According to God, people love simplicity. They want everything served up fast in a simple neat package to them. However, God is not a part of your simple box concept. You may want God to come down to your simple level and He might for awhile to help you. However, God wants you to come up higher and to see and understand the more complex subjects found in God’s Word. The implication given to us in the beginning of this verse is that God’s word is not simple. I have heard many try to make it simple and reduce it to a human level of intelligence, but they were mostly just confused in what they thought God said. There are many complex spiritual truths in the Bible and these are not always presented in simple terms using simple methods. However if you learn this fact, you can at least become aware of what to look for. 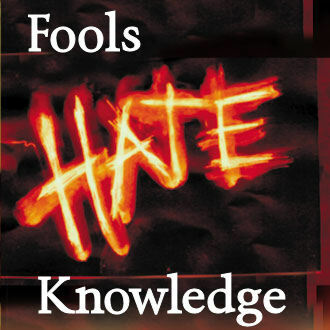 Proverbs 1:22 says that fools hate knowledge. I have seen a lot of fools in the world today. We are in fact raising a generation of fools. It has been rare for me to run across a young person that is truly hungry for the knowledge of God. There are just so many distractions in the world today. Television, movies, games, electronics, music, concerts, the internet, entertainment, sports and on and on I could go. It would appear that words on the pages of the Bible are the last thing that anyone would really want to spend time with these days. There are a huge number of distractions that keep young people’s mind off of anything that is productive or valuable. School is the last thing that most of them would call fun. But, God said fools hate knowledge. Knowledge involves learning, Learning involves hearing. Then when you throw in understanding on top of all of this, that is beyond the mindset of any modern teenager. Here is a key to knowing and understanding God’s Word. It involves you doing something after God does something and then God doing something in response to what you have done to solve the problem. This is the way God works in most normal cases in the Bible. God offers man reproof or correction and people are required to “turn”. Notice that unless you turn, God will not do anything else. If you think He will, you would be wrong. So you knowing anything from God will involve you turning. To turn implies a correction in your course and action. It could be a new way to think about something. It definitely involves you changing. I believe this is a continual process within life. Since God rarely gives us very much information at one time, we may need to make many course corrections as we continue our walk with God. The Bible is NOT SIMPLE! The SIMPLE DO NOT Understand the BIBLE! FOOLS do not want to Learn the BIBLE! God offers ALL of US Reproof! We MUST Turn and make Changes in order to Learn! IF WE CHANGE, God WILL then Pour Out His Spirit Upon US! The BIBLE Contains HIDDEN and CONCEALED INFORMATION! God will MAKE Known these Secret Things to ceretain individuals that qualify. Only With God’s Help Will We KNOW and UNDERSTAND God’s WORD! Understanding the Word of God is CONDITIONAL! I do hope that you can see and understand what these verses are telling us. In order for the Body of Christ to come into unity we will require God’s correction first. We WILL have to HEAR God’s correction. We will need to be OPEN to change. Then we will need to CHANGE. God will pour out His Spirit upon us and then we will all KNOW and UNDERSTAND the Word of GOD! It is not a long process, but it is a process none the less. People will need to put down their ego’s and become open to correction. Accepting reproof is not easy for anyone. Admitting you were wrong and changing will certainly be another challenge for others. What God is informing us in these verses is, that it is more up to us than it is up to God on how much we understand in the Bible. Understanding the Word of God is conditional. If you think UNDERSTANDING is automatic you will never achieve it. God is FAITHFUL, so He will do His Part, NOW YOU DO YOUR PART! God Bless!